Chimera Theatre will be bringing to the stage a new type of cast: puppets. In a tale originally by the Brothers Grimm, TRU alumni Andrew G. Cooper adapts the dark tale The Robber Bridegroom. The choice to use puppets instead of a live action cast was one made by Cooper in an attempt to really draw the audience into the storybook tale. The production will be almost entirely silent with the exception of the introduction and conclusion narration and the musical scoring. The choice for silence works was made to break down possible barriers in language and culture, making this an extremely inclusive production. The Robber Bridegroom is a tale of an impoverished miller who seeks a better life for his only daughter. To save the mill, they arrange for her marriage to a wealthy man from out of town. Of course, following the known darkness of the Brothers Grimm, this marriage does not go as smoothly as expected. “I’m still trying to figure out what genre it is. It’s part horror, part suspense, part thriller, part fairy tale and part puppet show,” Cooper said. 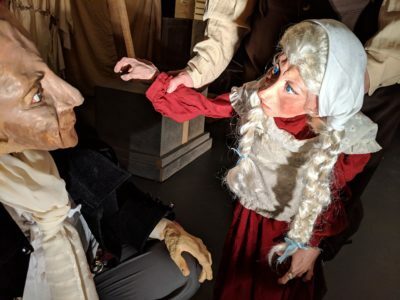 Through the use of puppetry and physical theatre, Cooper and Chimera invite Kamloops to experience this dark adaptation that explores intuition and the uncertain nature of humanity. The show is being advertised as 16+ because of the often violent and gruesome scenes that are depicted through the puppetry. On top of the puppetry, this story is largely told without spoken word. Sound designer and TRU student, Lukas Vanderlip, brings to life the story through the musical scoring which will carry the audience through the fairy tale. This production has a large portion of their cast and crew originating from TRU with Cooper and his co-director Melissa Purcha as TRU alumni. The Robber Bridegroom will also be taking on a more politically charged role on the topic of violence against women. Throughout history, women’s voices were often silenced and they were used as pawns. “We’re trying to get the female side of this story and make people see that point of view and open up a question and dialogue, ” Cooper said. Cooper hopes that through this production they can answer questions of responsibility and start to reconcile violence against women. “As a male and someone who is running the company, I thought it was important to get a bunch of female artists onto this show to collaborate and to lead the charge on this show so that we can have their voices in the art,” he said. The Robber Bridegroom will be running Jan. 23 to 26 at the Pavillion Theatre. Students are encouraged to attend the opening preview show on Jan. 23 with a Q&A after with the cast. Tickets for the production can be purchased at tickets.kamloopslive.ca on by calling the Kamloops Live! Box Office at 250-374-5483. Chimera Theatre will also be hosting a pay-what-you-can matinee on Jan. 26.